No age restriction. No border restriction. No credit or background check. No surrender of private information. No hidden fees. All while enjoying 7% annual network rewards if you help the network by mining. To open your free wallet on the EverGreenCoin Network, simply download and execute the free software. Joining this EverGreenCoin.org website is optional, but encouraged. March, 2019 Proof of Environment submissions collage. The 1st month of PoE was a tremendous success! April submissions now being accepted! Read previous 'Latest EverGreenCoin News' here. 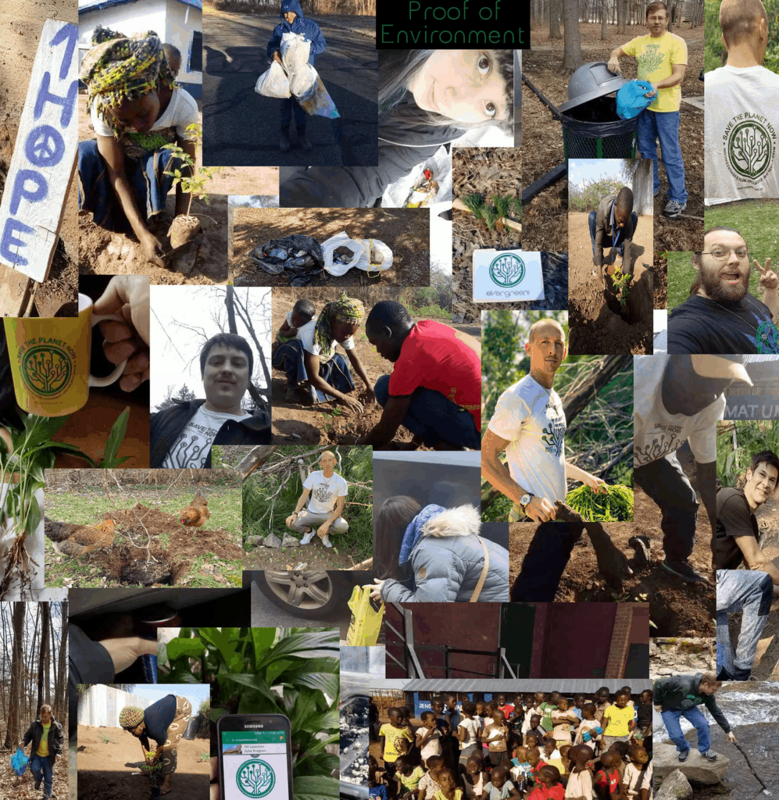 View recent community activity here on EverGreenCoin.org here. EverGreenCoin is much more than a new currency, a new 'cryptocurrency' as it's called. Cryptocurrency is a sort of digital money that can be used as a store of value or in exchange for goods and services. The EverGreenCoin currency itself is only the mechanism leveraged to nourish our more important focus, taking responsible care of our environment and the world we live in by helping to raise funds for environmental green projects. EverGreenCoin is a descendant of Bitcoin and EverGreenCoin inherited some great traits from its ancestors. Traits like being able to transfer anywhere in the world with near zero fees, regardless of borders. Zero risk to personal information loss or theft because personal information is never required. Zero manipulation by governments and banks because EverGreenCoin is not printed, or 'mined' as the case may be, out of thin air or at anyone's will. Rather the supply is predetermined, numbers never change without consensus of the network, and only the free market dictates its price. But we, the environmentally awake, will determine its true value. How has EverGreenCoin improved over Bitcoin? EverGreenCoin has taken its ancestral traits and built upon them, and in ways more friendly for both our planet and the people storing, spending, and receiving value with EverGreenCoin. This comes from Proof of Stake mining. Proof of Stake replaces the Proof of Work methodology for making transactions happen and securing the record of transactions that have happened in the past. This record is stored in an open and public ledger, the EverGreenCoin blockchain. For maintaining the blockchain through mining, you are compensated and this is true for both Proof of Work and Proof of Stake. The difference is that with Proof of Stake, you are not wasting electricity and taking a gamble on what your reward amount might be. With EverGreenCoin your reward is always 7% annual and the energy consumed is no greater than running a word processor on your computer and can be done in the background during times you already have your computer on and does not need to be done continually. EverGreenCoin is also much faster than Bitcoin. Transaction on the EverGreenCoin network are fully confirmed, which means fully received and spendable, much faster than a Bitcoin transaction. In what Bitcoin could transfer in an hour, EverGreenCoin could do many times over again. It is free to download an EverGreenCoin wallet and participate. You do not need to surrender any personal information. You do not need a credit check. There are no age or border restrictions. You do not need to make an account on this website, but it is encouraged as it will allow you to communicate with like-minded people. Click here for help deciding which solution is best for your needs. EverGreenCoin is organized into 'branches'. Each branch focuses on its area of expertise while coordinating with the other branches and sharing resources to work towards EverGreenCoin's goals. At the center of these branches is the EverGreenCoin Foundation, much like the trunk of a tree, it supplies the branches with resources and coordinates growth. New branches may emerge whenever there is sufficient community involvement to organize a new area of focus. When a new branch is formed, it has all the resources of the existing branches and the Foundation to help it grow and thus becoming a resource for the pre-existing branches, including the Foundation. The end-goal being a network of like-minded people, each focused on areas they are most knowledgeable and passionate about, becoming a towering organization of environmental efforts and success. is the base of all EverGreenCoin initiatives, operations, coordination, and funding now and in the future. starting with the development of a solar staker, that only needs sunlight to stake EGC. The EGC Wellness branch focuses on self-well-being areas such as medicinal, homeopathic, exercise, and nutritional. The EGC Water branch specializes in purified water and water conservation and the protection of our most valuable resource. EverGreenCoin Gardens supports gardening, farming, and all agricultural initiatives by EverGreenCoin and the EverGreenCoin community. Recently venturing into urban farming, we aim to help cultivate the self sustaining initiatives of others.